Ken Block and his driving skills are amazing. The 650 HP Ford Fiesta he drives is also amazing. What could be cooler than watching Block performing his long list of automotive parlor tricks? Watching him perform them in one of the coolest cities in the world, that’s what. What better place to make this type of video than San Francisco, with its famous vistas and hilly streets? Hit the jump for 10 minutes of City shredding. For some reason I don’t like Ken Block. It may be because of his huge sponsorships. It’s probably because I am jealous of his talent and the things he gets to do. One thing is for sure though, his talent is incredible. He is the best at what he does. Combine that with this great venue and you get a fantastic video. 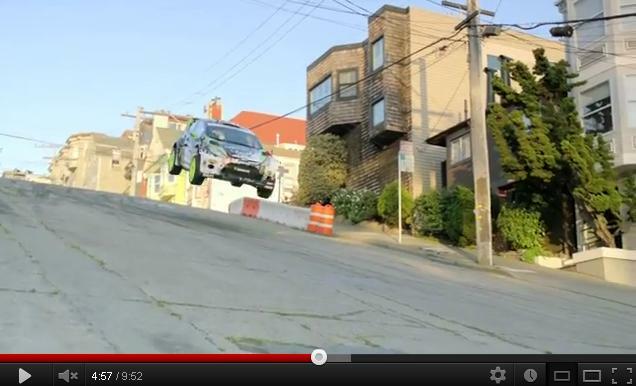 This entry was posted in Race cars, Sweet videos and tagged Gymkana 5, Ken Block, San Francisco. Bookmark the permalink.